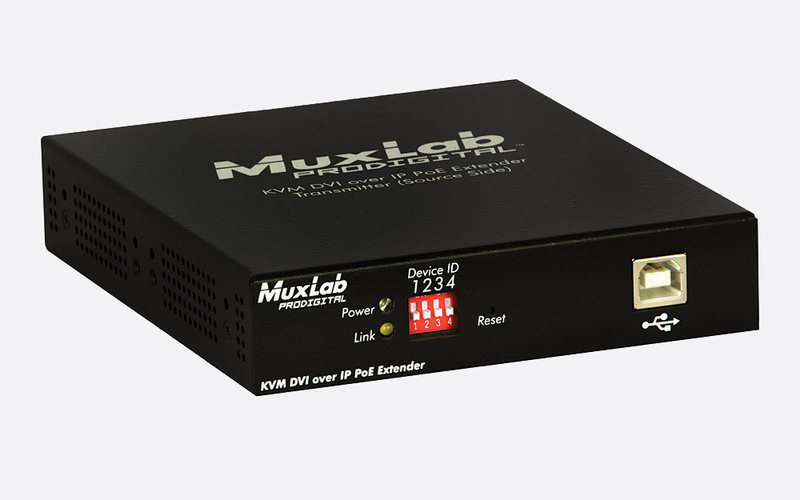 MuxLab video extenders are available in point to point, point to multi-point, and multi-point to multi-point configurations, facilitating the transfer of data from compatible equipment over IP for distances up to 120m. They are typically used for live video, broadcast, and studio to studio production and data transfer. This 3G-SDI Extender over IP with RS232 consists of a transmitter and a receiver as well as an IR emitter and IR sensor for remote control applications. It offers 'easy extension and distribution of broadcast quality SDI, HD-SDI or 3G-SDI video with embedded audio over local area networks'. It may also be used in point-to-point mode, without a network switch. Used as a point-to-point link, without a network switch, the kit will provide transmission of 3G SDI video over a length of up to 120 metres of Cat5E or Cat6 cable. 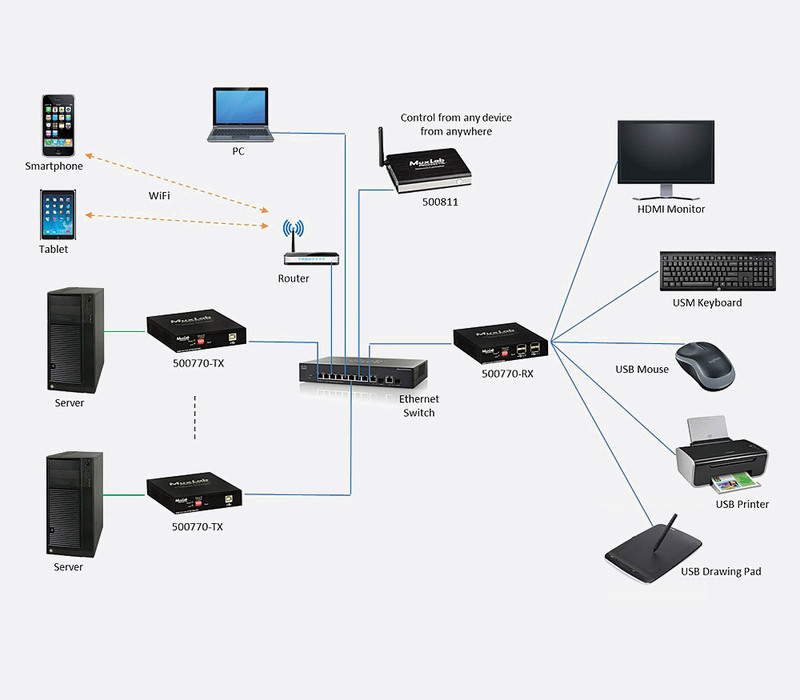 When used with a network switch, whereby point to multipoint, and multipoint to multipoint becomes possible, the maximum reach is set by the design of the network. If it is a Cat5E wired network, then each segment of cable can be up to 100 metres, so a simple network with a single switch has a maximum reach of 200 metres, if the switch can be placed exactly in the middle. The introduction of extra switches and perhaps fibre cabling will increase the available extension. Both the 500756-TX transmitter and 500756-RX receiver support PoE and have LEDs for 'Link' and 'Power' on the front panel, as well as four miniature (DIP) switches for setting the address of the device. On the rear they have a female BNC for the video connection, a 3.5mm jack socket for on IR emitter or IR detector, a socket for power and an RJ45 connector for the network connection. A 9-pin D-sub connector provides the RS232 connection in each case, with a male version on the receiver and female on the transmitter. Signals supported: SD-SDI, HD-SDI, 3G-SDI protocol, IR pass-through and RS232 bi-directional communication. Note that 3G-SDI level B is not fully supported. Embedded audio support. Bandwidth: 2.94Gbps. Power source: Both units may be powered by power over Ethernet where available, or 5V DC from two AC adapters. Power drawn: 2.9W transmitter, 1.8W receiver. Dimensions: 112 x 76 x 25mm, each unit. Weight; 0.5kg. Operating temperature: 0 to 40 degrees C.
Optional receiver and transmitter for 500756 video extender kit. This receiver (500753-RX) and transmitter (500753-TX) is intended to extend HDMI 1.3 or RS232 over IP with distances up to 100m using 1080p via a single Cat5e/6 UTP (unshielded twisted pair) in a point to point configuration. This distance can be extended up to 120m between both transmitter and receiver when no LAN switch is used. 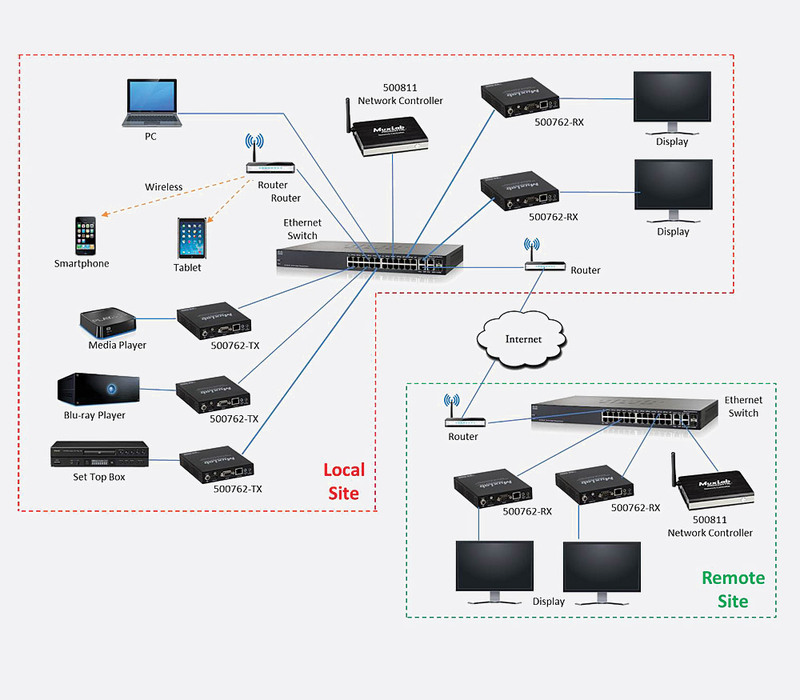 Point to multipoint and multipoint to multipoint configurations are possible by connecting multiple 500753-TX and 500753-RX to the same Ethernet network and incorporating an Ethernet switch with Gigabit ports, DHCP server capability and IGMP communications protocol. Both transmitter and receiver have a 4-channel DIP switch to set up the device ID on the front panel, along with a green LED to signify link status, and green LED to show power on. On the rear panel, a 5V DC power supply input is positioned next to a HDMI output (input on transmitter), RS232 connection, 3.5mm female jack connector for 'Sensor IR' ('Emitter IR' on transmitter), and RJ45 for LAN connection and PoE power. Dimensions: 112 x 76 x 25 (WxDxH) mm. Weight: 0.5kg. 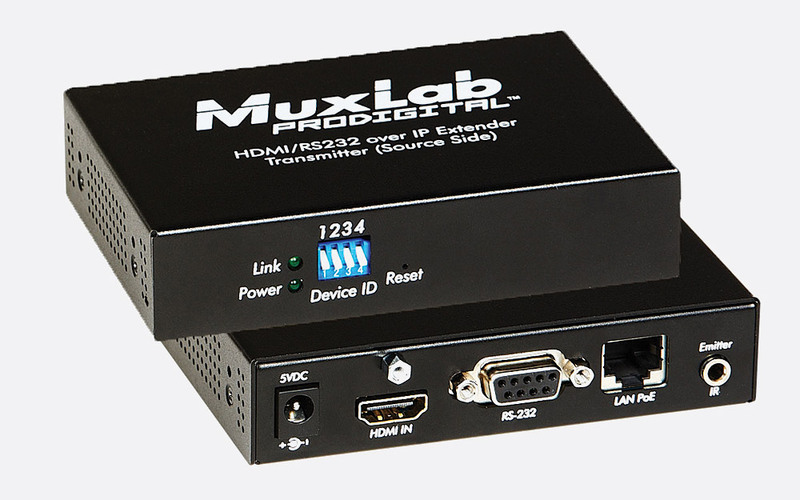 The 500758-RX receiver and 500758-TX transmitter extend up to 4K, 30Hz video signal via Cat5e/6 cable up to 100m point to point, point to multipoint, or multipoint to multipoint configurations from an Ethernet switch, with both transmitter and receiver having the option of POE power. RS232 and IR transmission are supported for remote control of both RX and TX. Both transmitter and receiver have a 4-channel DIP switch to set up the device ID on the front panel, along with a yellow LED to signify link status, and yellow LED to show power on. On the rear panel, a 5V DC power supply input is positioned next to a HDMI output (input on transmitter), RS232 connection, 3.5mm female jack connector for 'Sensor IR' ('Emitter IR' on transmitter), 3.5mm female jack socket for audio out (audio in on transmitter) and RJ45 for LAN connection and POE power. Dimensions: 112 x 129 x 25 (WxDxH) mm. Weight: 0.68kg. 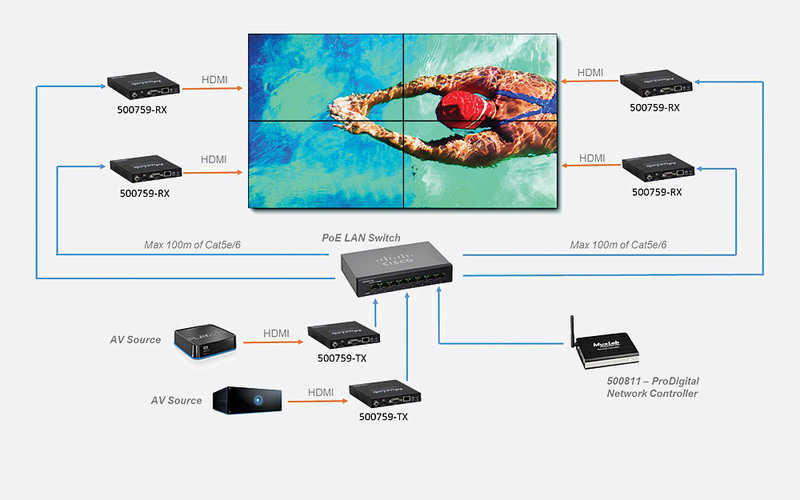 These units are similar to 500758-RX and 500758-TX however they have been designed to allow the extension of 4K, 30Hz or 1080p, 60Hz signal to create a video wall with only bandwidth hampering the number of receivers the user can implement. These units transmit and receive 4K, 60Hz video streams over IP H.254/H.265 to a distance of up to 100m. The transmitter (500762-TX) supports up to 1080p, 60Hz whilst the receiver (500762-RX) up-scales the 1080p to 4K, 60Hz, as well as supporting video wall and multi-view configurations. A benefit of the low bandwidth requirement of this equipment means audio and video data can be conveyed via local network, WiFi, and internet distribution. Multicast is supported along with RTSP, RTMP, HLS, FLV and TS. Transmitter connectivity is the same as 500758-TX, and receiver connectivity is the same as 500758-RX with the addition of USB3.0 and S/PDIF and TosLink output located on the front panel. Dimensions: 111 x 129 x 25 (WxDxH) mm. Weight: 0.4kg. 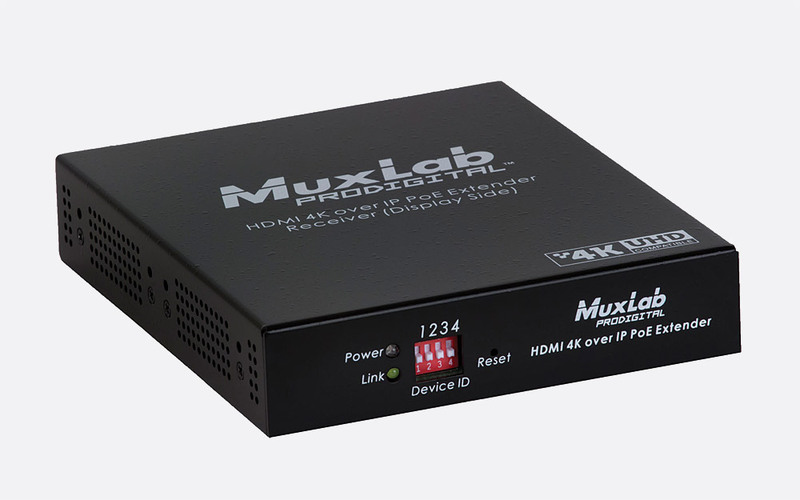 This product allows the transmission or reception of HDMI 1.4 and USB data up to a distance of 100m via Cat5e/6 in a point to point or point to multipoint configuration. It supports HDMI source up to 1920x1200 and 1080p, 60Hz. Both transmitter (500770-TX) and receiver (500770-RX) support POE when used with Ethernet switch. Both transmitter and receiver have a 4-channel DIP switch to set up the device ID on the front panel, along with a yellow LED to signify link status, and LED to show power on. Also on the front panel of the transmitter is a USB type B socket; the receiver has four USB type-A connectors. On the rear panel, a 5V DC power supply input is positioned next to a HDMI output (input on transmitter), 3.5mm female jack socket for audio out (audio in on transmitter) and RJ45 for LAN connection and POE power. These products are the same as 500770-RX and 500770-TX except that in place of the HDMI connections, DVI in (500771-TX) and out (500771-RX) are positioned on the rear panel. 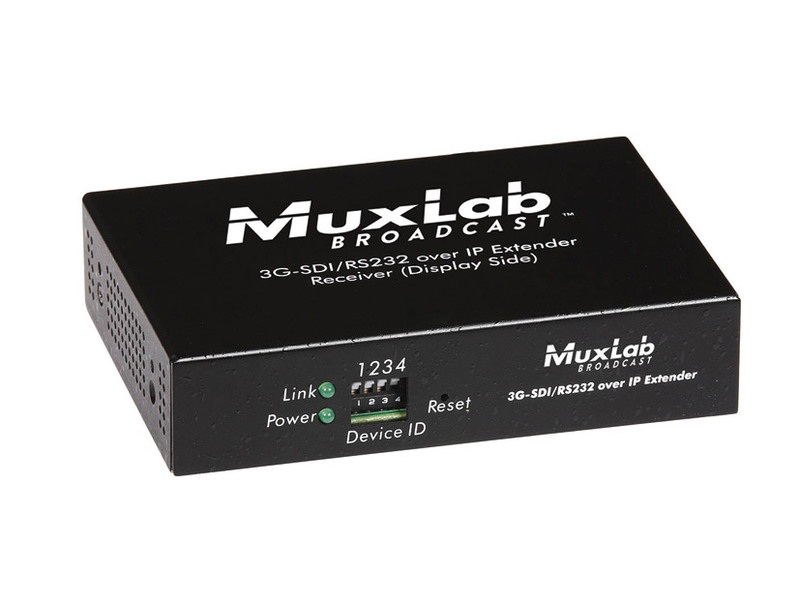 Note: Although standard Ethernet technology can be used, and technically could be used in a network with other traffic, Muxlab do not recommend this for some of the above products, due to the throughput of traffic generated by the extenders.